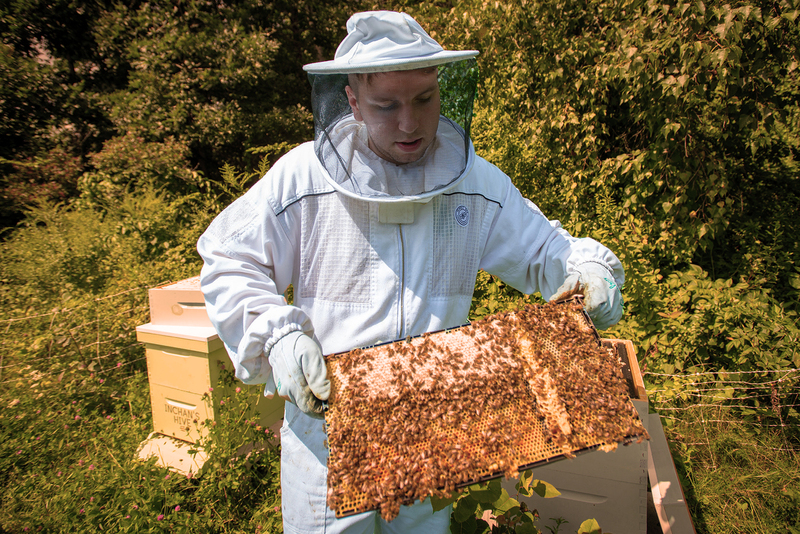 Shortly before Andy DeMeo graduated from UNH in December 2017, he won first place in UNH’s NH Social Venture Innovation Challenge and received $5,000 to help get his beekeeping business off the ground. Since then DeMeo, who was an environmental conservation and sustainability major, and his partner Jessica Waters started Half-Acre Beekeeping. Customers purchase shares in honeybee hives on nearby farms in exchange for regular deliveries of raw honey. COLSA: What are you doing now? Andy DeMeo: Staying civically engaged in Newmarket, working my dream job at the non-profit Second Nature, and running Half-Acre Beekeeping, a NH seacoast-based beekeeping business. My partner and I also bought a big green truck yesterday, which we have registered under the vanity plate "Fangorn. "* Life is swell. *Editor’s note: In J.R.R. Tolkien's Legendarium, Fangorn is a forest located in Middle-earth. COLSA: How did your time at UNH prepare you for where you are today? DeMeo: I don't even know where to begin. If I had to describe the most valuable thing UNH did for me, it was providing me with a great environment in which to fail. Seriously — I messed up so many times! Whether I was struggling with classes, losing friends, throwing a failed event for a club or residents, not getting a job, not getting an internship, messing up at work, losing competitions, being a terrible dancer, or failing 500 times before I could make a decent egg-white omelet, one thing was the same across all failures — I was always surrounded by a community of professors, friends, and co-workers who encouraged me to keep learning, keep trying, and keep failing! In the end, UNH taught me how to follow my passion, start a business, enjoy public speaking, swing dance, cook a mean omelet, and 10,000 other great things I never imagined myself doing. I wouldn't trade it for anything. COLSA: Where do you see yourself in five years? In 10? DeMeo: Career wise? I hope I am still with Second Nature in 5 years — I love my job. In 10 years maybe running my business full time. Frankly as long as my bees are healthy and my accordion skills improve, I will be happy. COLSA: What do you know now that you wish you'd known while an undergrad? DeMeo: Your personal connections and ability to help others matter 100 times more than your resume or major. Don't network-- make friends. It's more fun and more productive for everyone. Talk to your professors! Get to know them. COLSA has some incredible people. And go to the ECenter. COLSA: What person or course most influenced you while at UNH? How? DeMeo: It's hard to pick because I actually feel like all of my professors were great, but overall it would be Fiona Wilson and her course Business for People Planet and Profits (ADMN 444). Changed my life! She taught me all about social entrepreneurship and what the future of business and sustainability really looks like. Three years later (with a lot of help) I became a social entrepreneur myself. Other big influences on me were professors Clay Mitchell, Tom Safford, Debra Straussfogel, Cat Ashcraft, and Mary Friedman. They are all incredible and go out of their way to help every student feel engaged. COLSA: What was the best/most memorable course you took at UNH and why? DeMeo: Environmental Sociology (SOC 665). Tom Safford does an amazing job of tackling environmental justice with nuance, accuracy, and passion. The way he approaches and discusses topics is a literal inspiration for how I try to talk about causes or issues that are important to me. COLSA: What advice do you have for students interested in your field? DeMeo: If your institution has a sustainability office, go work there. Otherwise just get in touch with professionals in your field and ask about work opportunities. Ninety-nine out of 100 times leaving your apartment to go to a networking event/opportunity will be more productive for your career than sitting and applying for positions online. Most people are kind and interesting and love sharing their stories — go talk to them! If you don't know how to do something that might be required, just say yes and learn how later. COLSA: What do you miss most about UNH? DeMeo: The food! And being an RA in Hubbard Hall.